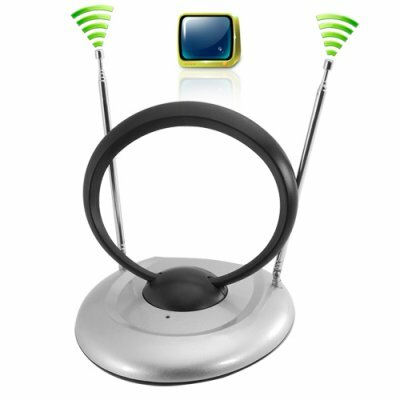 Successfully Added Wholesale Powered Indoor TV Antenna for Digital and Analog TV to your Shopping Cart. Enjoy high quality TV without paying monthly digital cable or satellite fees with this China Wholesale Priced powered TV antenna. The device is specially designed to receive digital and analog broadcast signals. Who needs a powered indoor TV Antenna? Anyone looking for a really good antenna for your new digital TV set so you can receive those free digital TV channels and over-the air- television programming. In addition, if you are just looking to replace your old passive analog antenna or "rabbit ears" with a powered antenna so you can pick up more TV channels and get a clearer signal, then this is the one product your home really needs! This product is suitable for home television as well as a good choice for portable TV sets that are located inside boats, RV's, campers, and cabins. This product is in stock in our warehouse right now for both small sample orders as well as bulk OEM orders. Get yours today and start enjoying a clearer TV signal reception. Will this work in the United States or Canada? Yes, but you would need to use a adapter to change the PAL connector on the cable to a North American coaxial connector (adapter can be bought at Radio Shack). Can I use this without it being plugged in? Yes, but it works best when you plug it in and adjust the gain control to maximize its effective range and signal capture.